The Rev. 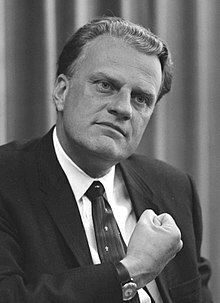 Billy Graham, a North Carolina farmer’s son who preached to millions in stadium events he called crusades, becoming a pastor to presidents and the nation’s best-known Christian evangelist for more than 60 years, died on Wednesday at his home in Montreat, N.C. He was 99. His death was confirmed by Jeremy Blume, a spokesman for the Billy Graham Evangelistic Association. A central achievement was his encouraging evangelical Protestants to regain the social influence they had once wielded, reversing a retreat from public life that had begun when their efforts to challenge evolution theory were defeated in the Scopes trial in 1925 .